"Critically Important . . . "
SEATTLE - June 10, 2016 - PRLog -- Tamara's two sons were killed by a drunk driver in 2006. Carl's father was killed by two drunk drivers in 2007. Bill and Julie lost three loved ones to a drunk and drugged driver in 2007. Karin lost her daughter and her husband in 2010; her husband was the drunk driver. They all have one thing in common: an aftermath of intense heartache and a rollercoaster of emotions ranging from shock, anger, sadness, and disbelief to forgiveness, healing, and hope. 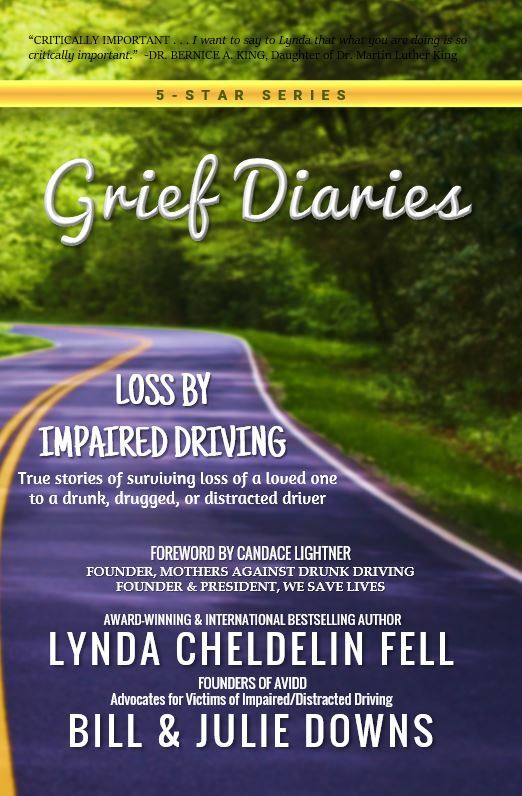 Grief Diaries, a brand dedicated to raising awareness and offering comfort and healing in the aftermath of life challenges and losses, released Grief Diaries: Loss by Impaired Driving, its eleventh title in the 5-star series on June 10, 2016. Offering an intimate collection of true stories by 17 people who share an unspeakable journey, this book is like a portable support group. Filled with answers to poignant questions, each writer shares insight into the process of coping with tragedy that will serve as a source of strength. Readers facing the same heartbreak - losing a loved one to impaired driving - will discover comfort and hope in every story. The Grief Diaries series debuted in December 2015, and is now a 5-star series with over 300 writers. Packed with intimate experiences, each anthology book is designed to offer understanding and promote healing in the aftermath of life challenges and losses. Created by bereaved mother and international bestselling author Lynda Cheldelin Fell and published by AlyBlue Media, the anthology series is available around the world.